As we were gearing up to cruise everyone seemed to take it upon themselves to tell us all the things that we just couldn’t live without – whether we asked them or not. People we barely knew took it upon themselves to tell us what we couldn’t afford not to invest in. 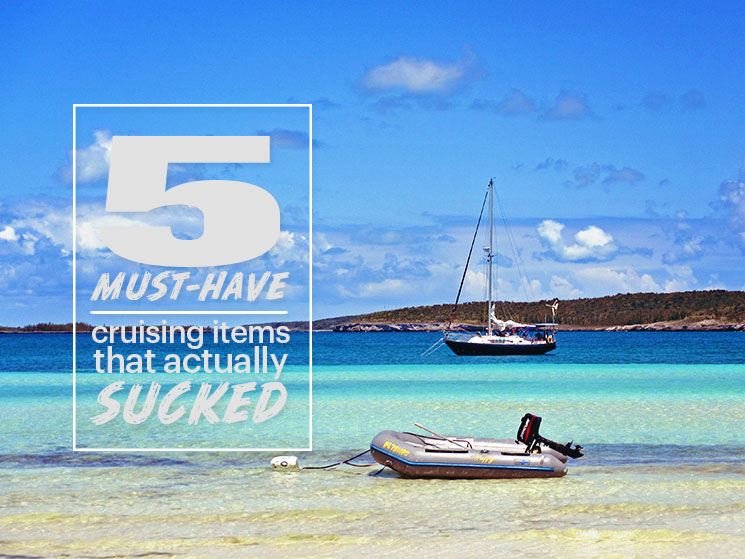 In the spirit of saving your hard earned cruising kitty (I really do hate that term) I am sharing with you my List of 5 Must Have Cruising Items That Sucked or Were Never Used. 2. Helly Hanson Foul Weather Jacket – Let me paint you a picture. Jason and I are at the Annapolis Boat Show, about a month and a half before we’re supposed to depart on this journey. We’ve eagerly been soaking up every sales pitch imaginable when we happened upon the Helly Hanson booth. We also are still employed. I quickly browsed the women’s selection while contemplating how anyone could spend over $500 on a jacket that has a main purpose of getting wet. I mean we weren’t even going to be sailing where it was cold so we wouldn’t need the heavy fabric. Before I could even finish my thought Jason pops on over with a huge grin on his face, “I found this awesome jacket and it’s on sale. Thirty minutes later we left the HH booth a couple hundred dollars poorer. Now, I’m not one to shy away from spending money on quality products but this thing just did not perform. The jacket is made of two layers and when the top layer gets wet, it doesn’t dry, making the jacket weigh several pounds. Add in the fact that the seams leaked and with the fabric not drying, the water soaked into the inner layer leaving the jacket pretty much useless. HH even replaced the jacket for Jason once and the new one does the same thing. I think I’ll stick to my $30 pink Colombia rain shell I got from TJ Maxx. That thing leaves me dry as can be! 3. The biggest Dinghy motor you can get your hands on – Every cruiser knows that when living on the hook (at anchor) your dinghy is your car. It is how you get from one sundowner to another, and how you get to all those remote reefs. You need the biggest motor you can get so you can get to reefs 10 miles away in a blink of an eye. We have a Mercury 5 hp 2 stroke. For those of you unfamiliar with outboards, this isn’t the smallest motor you can get but certainly is close to it. While it may have come in handy having a bigger more powerful motor at times, we both really grew to love our little outboard. With a 2 stroke the engine has more power for the size and is considerably lighter than 4 stroke models. I could easily lift the motor on my own. After hearing one too many distress calls from nearby boaters who dropped theirs in the water while trying to get it off the dinghy, I was glad it we had a handle on at least this part of our cruising life. It was also small enough that I could operate it on my own. What if something happened to Jason and I had to go get help? We do eventually want to get a bigger outboard, but as an addition, not a replacement. I love our little Mercury. 4. Windlass – Now this one falls into the category of things we just never got around to installing and figured out how to live without it. And, never really felt like I absolutely needed it to survive (at least in the shallow waters of the Bahamas). Now, Jason and I are young and in shape so pulling up our 35lb anchor by hand wasn’t really that big of a deal. How else do you think I got my chiseled traps? I may have gotten a few bruises from the chain smashing into my ankle, but if it didn’t come from the chain, I would have found another way. We do still fully plan on installing the windlass, but we were absolutely able to successfully sail without it. 5. Correlle Dishes – These are awesome, until they aren’t. Before I moved aboard I admittedly read way too many posts on how I just wouldn’t want to eat off plastic plates every night and would need the feel of real glass plates and that Correlle would be the closest I could get to that. Not one to argue with the masses, I snapped up a set. These seemed OK at first, outside of the fact that they are not good with hot foods. I mean you cannot hold a bowl of hot soup or rice and beans with your bare hands. We’re talking 2nd degree burns here. Then, hypothetically, think about the off chance that you could encounter a random gust of wind, heeling the boat over enough to send all the plates and bowls out of the cabinet and into the bilge because you have the floorboards up because you are obviously doing engine work. Hypothetically. Those plates will come shattering down and break into thousands of the tiniest of shards that you will find as they so sweetly lodge themselves into your foot for months after the hypothetical incident. So tell me, what products were you sold that didn’t work out as you hoped? Previous articleWhere in the World is Chance? As some one who lived and sailed in the west indies for 15 years- stop buying sailing products and buy fishermen’s gear. Look to the maine fishermen for rugged, cheap workaday goods. If you think the clothes and boat goodies are overrated- wait until someone try’s to sell you on systems. Keep it simple. Lead line, solar panel, row boat and anchor. I gotta agree that they is a lot of useless crap out there. We have a set of OXO on board and love it! We can’t pull the lids off, and we did the ‘chuck it around the store and bang it on corners test’ (this is an certified scientific method) before buying. The product should be made out of Lexan, so I wonder if its a bad batch or a knock off?? Go with what the fisherman use, it ain’t pretty but it works. You know the ones that people buy to wash their car? Useless… as soon as they get wet and you try to pick up the sponge to squeeze it in to the bucket and all the water just falls out again. Bailer sailor sponges are the only decent ones. More expensive, but I love those damn things, they soak up water in the bilge soooo well! I’m with you on the Correlle. Luna Sea came with a set – and I was thrilled! I’d read all the posts about how awesome they are. Then I had several shatter during a strong heel. Ironically, they were stacked up outside of the cabinet in order for me to remove them from the boat – I just forgot about them when I was securing things before an impromptu sail. Needless to say – they instantly came off of the boatl. The ones that survived, anyway. Kelley, even though I actually find a bunch of the stuff on your list to be invaluable, this FANTASTIC info because it dispells a bunch of commonly held conceptions- and gets to the “other side” of some popular items. Like OXO bins, which def aren’t watertight do break (although we’ve only lost 2 in 6 years, which I can live with- the tradeoff of how well they use space in our galley is worth it to me for now!). And although I love my Corelle dishes, you are bang on about how well they transfer heat (OUCH! ), although we’ve not broken one of those in 6 years either (and they’ve certainly been flung around a few times). While you don’t *need* a big windlass or outboard, they can limit your options- you may judge this differently with more regions under your cruising belt. Areas that rank among our favorite cruising grounds- like Indonesia’s Raja Ampat, or much of Papua New Guinea- would be very, very difficult for to anchor or properly enjoy without a windlass or a planing dinghy. Loved the blog but as Behan alludes to it is horses for courses. We love our corelle plates as they are so easy to clean but have real ones for those special occasions. We are in the bed where on occasions you may be anchoring in 30m so a windlass is a must. We have also cursed on occasions at the size of our outboard as it is too big and heavy to manage alone. Ideally we would have two. A big one and a very light egg whisk for those short runs. Keep up the blog.. loving it. One of the worst things I had on-board was a spirit level for those jobs that had to be straight. They are useless in a dodgy anchorage. Even worse when I have the dinghy hauled up the starboard side and my 20 stone wife trying heave the holdall out of it at the same time. Bill – I completely forgot about that one! The most Dewey and Riley did was lay on it when they missed actual grass. We ended tossing it as all it was doing was taking up space. Really expensive sunglasses for me are not meant to be. I have a few hundred dollars sleeping with the fishes, or, I somehow bump them up against a grinder or sandpaper. I’m not at the point of leaving to cruise, yet, but I want to thank you, one for the blog, and two for the comments from others. As for fancy crockery, I’m still on Melamine. It’s light, stores easily and although it can be scratched, it seems to last. I have a windlass that I will be renovating. I’ve had enough of dragging chain over my ankles, lol. Thanks for the ‘tips’ guys. i agree Melamine is the way to go. We have had out set 25 years until we just got tired of them and wanted a prettier set. Big Lots had them on the cheap in Newport.